Marine litter is a clearly visible problem along the Baltic Sea coastline. It also appears under the surface and in many different size classes. The smallest microlitter is invisible to the human eye, but reaches the marine food web when animals ingest it. litter items are found for every hundred meters of Baltic Sea beaches. Plastic litter is of special concern since it degrades very slowly. of the litter items in the Baltic Sea are plastic. Marine litter is a clearly visible problem along the Baltic Sea coastline. It also appears under the surface and in many different size classes. The smallest microlitter is invisible to the human eye, but reaches the marine food web when animals ingest it. Larger marine litter deteriorates habitat quality and can cause direct harm to animals when they swallow it or become entangled. Around 70 % of the marine litter in the Baltic Sea is plastic. Plastic materials are of special concern due to their risks to the environment and slow degradation. The regional goal agreed in HELCOM is to reduce the amount of marine litter significantly by 2025 and prevent harm from litter in the coastal and marine environment. Besides having effects on the environment, marine litter also has a strong socioeconomic dimension. Marine litter may affect human activities and health, reduce the value of tourism and recreation, or result in direct costs for removal. It can also damage fishing gear, contaminate catches or be a risk to navigational safety. Marine life is impacted both directly and indirectly. Litter may cause harm to animals when they ingest it, by clogging or injuring their digestive tract, or by causing contamination. Another main impact occurs when animals are entangled and strangled in lost fishing equipment or packaging material. Additionally, marine litter affects the quality of habitats by effects on physical structure or local biogeochemistry, and is a possible vector for the transfer of non-indigenous species, leading to effects on biodiversity. The risk associated with microlitter for marine animals is under extensive study (Werner et al. 2016). Artificial, polymer materials, more commonly known as plastics, are of special concern due to their longevity, which is further prolonged under the photic zone, and because they may be a pathway for harmful chemicals into the food web. Globally, it is estimated that 275 million metric tons of plastic waste were generated in 2010, calculated for 192 coastal countries, and that between 4.8 and 12.7 million metric tons entered the ocean, and that the world annual plastic production is still increasing (Jambeck et al. 2015). Most plastics are used in packaging or in the building industry and are discarded within a year of their production. In HELCOM, assessment approaches based on core indicators are currently underway for beach litter, litter on the seafloor and microlitter. Threshold values for the assessment are being developed in an EU-process. Monitoring of beach litter at Baltic Sea regional scale is under development. Currently available data give an indication of how marine beach litter is distributed along Baltic Sea shorelines, suggesting that the highest densities of beach litter occurs in the Gulf of Finland, Bothnian Sea, and Northern Baltic Proper (Figure 4.3.1). The differences among sub-basins are attributed to actual differences in littering, as well as in the levels of beach cleaning. In addition, the shape of the coastline, winds, and the direction of water currents appear important in determining where litter accumulates. Figure 4.3.1. Indication of the occurrence of beach litter items in different sub-basins of the Baltic Sea, presented by eight regionally agreed litter material categories (‘Plastics’ denote all types of artificial polymer materials). The monitoring results have been recalculated to represent the number of litter items per hundred metres of beach. The bars show averages for all countries within the same sub-basin based on available data from Denmark, Estonia, Finland, Germany, Latvia, Lithuania, Poland and Sweden over 2012-2016., However, there is variability with respect to the time period for monitoring and the length of beach monitored in the underlying data. Differences among geographic areas are influenced by the level of local human activities but also by various other factors, such as the shape of coastline, winds and water currents. Source: HELCOM (2018ad). The monitored sites are categorized into either urban, peri-urban, rural or reference beaches, based on how close they are to human activities. The average number of beach litter items on reference beaches is about 47 per hundred meters of shoreline, and up to about 280 items per hundred metres on urban beaches (HELCOM 2018ad). Plastics are clearly the most common litter materials (Figure 4.3.2). In much smaller amounts, paper and cardboard are the second most common materials on urban beaches, whereas metal, glass and ceramics are the second most common on the other three types of beaches. Litter items at urban and peri-urban beaches are more likely to originate from activities on land close to the monitored site, whereas beach litter recorded at rural and reference beaches are more likely to come from sources at sea. Figure 4.3.2. 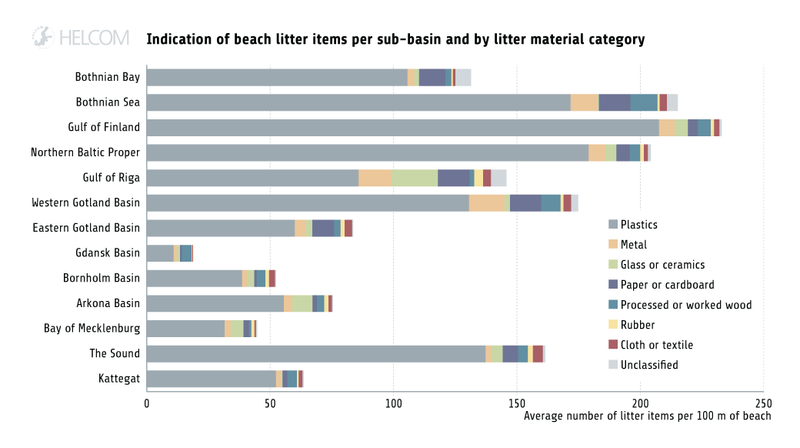 Proportions of beach litter items within each of eight regionally agreed litter material categories. The results are presented separately for beaches classified as either urban, peri-urban, rural or reference beaches, based on estimates of the average number of litter items per 100 metre of shoreline in the Baltic Sea using available data for years 2012- 2016. Source: HELCOM (2018ad). The most frequently occurring beach litter items at Baltic Sea scale are attributed to eating, drinking or smoking activities, such as food wrappings, bottles or lids, as well as plastic pieces of different sizes (Table 4.3.1). These items are common in all parts of the Baltic Sea, together with items related to industrial packaging, such as sheeting, strapping bands and masking tape (based on data from fifteen sub-basins). 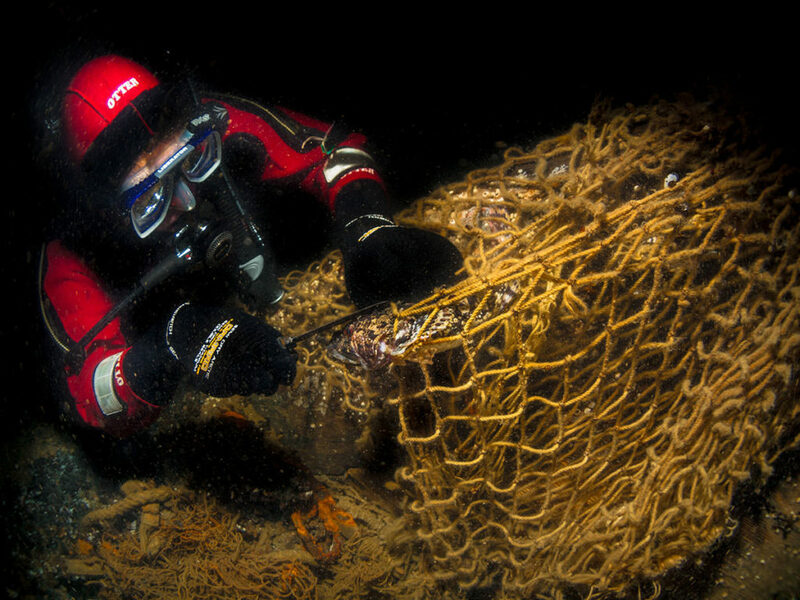 Derelict fishing gear are among the twenty most common items in the Eastern Gotland Basin, Gdansk Basin and Kiel Bay. It is noteworthy that balloons or balloon-related items are found among the top ten items in nine of the fifteen sub-basins (HELCOM 2018ad). Table 4.3.1. Ten most frequent litter items at Baltic Sea level at different types of beaches, categorized into urban, peri-urban and rural beaches. The colours identify items categorized as: plastics (artificial polymer materials; grey), paper or cardboard (purple), metals (orange), glass or ceramics (green), and process wood (blue). The results are based on data from Denmark, Estonia, Finland, Germany, Lithuania, Poland and Sweden. Data for reference beaches in Denmark are included under rural beaches. For each survey, the 20 most frequently sampled items were listed, and scores were given to each item. After this, the results for different surveys were merged to provide a regional lists of top ten items. Only data from seasonally monitored sites are included, to prevent from overestimating occasional events. Source: HELCOM (2018ad). Litter that enters the marine environment can be transported over long distances by water currents, and it often accumulates on the seafloor, far away from its original source. Hence, all types of sources can contribute to seafloor litter. However, items associated with maritime activities are a major component. So called ‘ghost nets’, which are defined as abandoned, lost, or otherwise discarded fishing gear, pose an especially large risk to marine life since they continue fishing, trapping not only fish, but also other marine life including birds and marine mammals over long timeframes. Experiments have shown that the catching efficiency of lost gillnets amounts to approximately 20 % of the initial catch rates after three months, and around 6 % after 27 months (WWF Poland 2011). Ghost nets are lost fishing gear that continue fishing on the sea floor, catching fish as well as other species. Photo: Wolf Wichmann. Seafloor litter is monitored in connection to fish trawling surveys, by counting litter caught in the fish trawl. The survey provides an indication of litter on the seafloor, but does not cover shallow water areas or complex substrates, and not all parts of the Baltic Sea. For example, the Gulf of Bothnia is not covered. Items made from natural materials, such as wood, natural fibres and paper, and plastic items dominate in most sub-basins (Figure 4.3.3). The proportion of metal items is highest in the Kiel Bay and the Eastern Gotland Basin. Slightly over half (58 %) of the 1,599 hauls reported in 2012-2016 contained marine litter items (HELCOM 2018ae). The average number of items was clearly highest in the Western Gotland Basin. Plastic was the most common litter material category at the Baltic Sea scale, constituting on average around 30 % of the number of items and 16% of the weight. A weak but statistically significant increase in seafloor litter representing non-natural materials was seen over the studied time period. Figure 4.3.3. 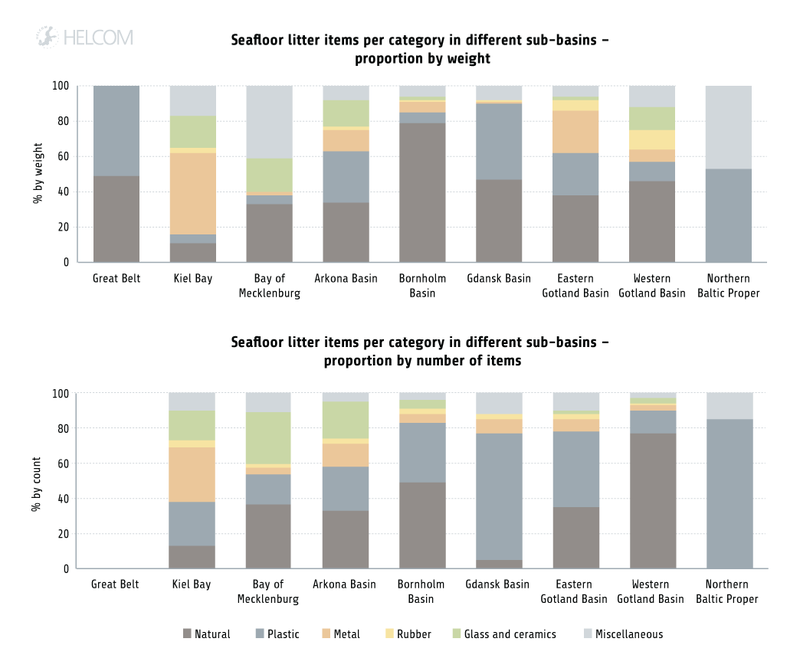 Proportion of marine litter material categories in bottom trawl hauls for sub-basins covered by the survey. No data for number of items by category was available for the Great Belt. Based on data from the Baltic International Trawl Survey coordinated by ICES, summed for all years 2012-2106. Source: HELCOM (2018ae). Most of the environmental harm of microlitter has been associated with microplastics, and the potential risks associated with ingestion of microplastics by marine organisms. The composition of microlitter with respect to different materials has not yet been regionally assessed in the Baltic Sea. Based on the composition of other types of litter in the Baltic Sea, it is likely that the majority of microlitter is derived from the breakdown and usage of larger plastic litter items, although other components may also be important (Magnusson et al. 2016, See also Box 4.3.1). So far, microlitter has only been sampled for a few years in the Baltic Sea and a number of different methods and sampling devices have been used. Coordinated regular monitoring is under development. As one example of results, 0.3-2.1 particles per cubic metre were noted in the Gulf of Finland (Setälä et al. 2016) and 0.04-0.09 particles per cubic metre were recorded in the South Funen Archipelago, Belt Sea (Tamminga et al. 2018), both studies using Manta trawls with mesh sizes over 333 micrometres. In comparison to other seas, studies of the abundance of plastic debris near the Swedish city of Stockholm has been estimated to be at similar level as close to urban areas in California, USA, and the overall abundance in the Stockholm Archipelago similar to reports from the north-western Mediterranean Sea (Gewert et al. 2017). Box 4.3.1 What is microlitter? The term ‘microlitter’ is used for litter particles smaller than 5 mm, but they can also be much smaller (GESAMP 2015). Some studies have focused on particles as small as 20 or even 10 µm. Many types of marine litter degrade very slowly and inputs to the sea accumulate in the environment – in the living environments of organisms or inside of species. In addition, the degradation process will change the nature of the problem, so that litter entering as macro-litter may turn into microlitter over time, and may additionally cause chemical effects. Political will and robust regulatory action are key factors for reducing the pressure from marine litter. Efforts to change consumption patterns are key to stop litter from entering the marine environment, and are expected to depend strongly on public awareness. In addition, regulatory frameworks and actions to improve waste and wastewater management are of high significance. A large number of measures have been agreed on by HELCOM over recent years, which directly or indirectly can be expected to result in reducing amounts of marine litter. The 2013 HELCOM Ministerial Declaration (HELCOM 2013a) contains a commitment to achieve a significant quantitative reduction of marine litter by 2025 (compared to 2015) and to prevent harm to the coastal and marine environment. To achieve this goal the effective and timely implementation of land-based, sea-based and educational and outreach actions as defined in the HELCOM Action Plan on Marine Litter is needed (HELCOM 2015c). This website is produced by the Helsinki Commission (HELCOM – Baltic Marine Environment Protection Commission) and co-founded by the European Union through the SPICE project. ©HELCOM 2017-2018. All rights reserved. Drowning in fishing gear can be a strong pressure on populations of divers, grebes, cormorants, alcids, mergansers and ducks, especially in wintering areas with high densities of waterbirds. Diving waterbirds are especially vulnerable to being entangled in gill nets and other types of nets. Incidental by-catches also occur in other types of fishing gear, such as longlines and traps (ICES 2013b). A rough estimate indicated that between 100,000 and 200,000 waterbirds drown annually in the North and Baltic Seas, of which the great majority drowns in the Baltic Sea (Žydelis et al. 2009, 2013, Bellebaum et al. 2012). Beside the assessment of incidental by-catch, hunting must also be taken into account (See Chapter 4.6 Species removal by fishing and hunting) because the total anthropogenic mortality has to be related to the population in order to assess its impact. A HELCOM core indicator to assess the number of drowned mammals and waterbirds caught in fishing gear is undergoing further development (HELCOM 2018au). One human activity can cause many different pressures, and each of these pressures can affect organisms in various ways. The effects can also be hierarchically dependent. For example, the input of chemical substances can lead to reduced available energy of a species due to the energy exerted in combating the chemical. This can lead to reduced energy reserves for reproduction, resulting in negative population effects. Such cascading effects can also result in changes in community composition and biodiversity. The Baltic Sea Impact Index uses sensitivity scores based on a regional scale expert survey in order to cover a broad range of topics in a similar way and makes use of existing expertise on the different ways in which pressures may impact the environment. The results can be further validated by a review of selected linkages, available in the literature. Examples on how such pathways can be outlined systematically using a literature analysis tool are given below. The examples are shown for selected pressures affecting seagrasses and blue mussels, which are keystone species providing habitat for a huge number of other species which interact and are also dependent on one another. Major threats to seagrass result from nutrient inputs and habitat loss, the majority of which are from land such as from the oversupply of fertilisers or improperly treated waste water. The increased nutrient levels favour phytoplankton and epiphytes growing on seagrasses, leading to overgrowth and shading and finally to a reduced biomass of seagrass. This effect can be exacerbated by increased current velocities, caused for example by construction activities: snails, normally grazing on seagrass for epiphytes and thus, mitigating the overgrowth effect, are washed away and disappear. Deposit of dredged material in sea grass covered areas and dredging activities, bury and extract seagrass, respectively, and therefore have a direct impact. Additionally, re-suspension of sediments reduces light availability, leading to decreased photosynthesis and decreased growth. Some antifouling additives from ship coating reduce the photosynthetic efficiency of seagrass. Herbicides from agriculture may also affect seagrass and cause similar effects. Increased water temperatures caused by climate change not only affect growth and survival of seagrass but may also favour the spreading of pathogens, such as the potentially epidemic wasting disease which has been responsible for major seagrass declines in the past. Additional important pressures affecting seagrass meadows are for example oxygen depletion and increased sulphide concentrations, direct and indirect effects of fisheries, and acidification (Figure B.6.1.1). Figure B.6.1.1. Effects of selected human activities on seagrass meadows. Based on systematic literature review using the LiACAT tool (HELCOM 2016f, Eilers et al. 2018). Blue mussels are sensitive to heavy metals and other pollution, since they are filter feeders and accumulate metals directly. Sources of contaminants are industries, land-based activities, air deposition, and activities at sea, such as harbours, shipping, industry, and oil spills. The defence mechanisms that are induced in the mussels are energetically costly for them, and alter heart rate and respiration. Additionally, physical condition is impaired, growth is reduced and mortality increases. The magnitude of these effects is dependent on environmental factors such as salinity, temperature and oxygen conditions. Changes in water temperature can be caused by local industrial heat sources or by climate change. In combination with acidification, effects on early development stages and on shell thickness have been observed. Moreover, shell growth and mortality are negatively affected by the interactive effects of reduced salinity and increased temperature. Seabed disturbance caused by fishing activities may lead to the decline of blue mussel, by removal of species and abrasion. The invasive species Crassostrea gigas is considered to compete with blue mussels and may alter the effects of anthropogenic pressures due to different tolerance levels towards the pressures (Figure B.6.1.2). Figure B.6.1.2. 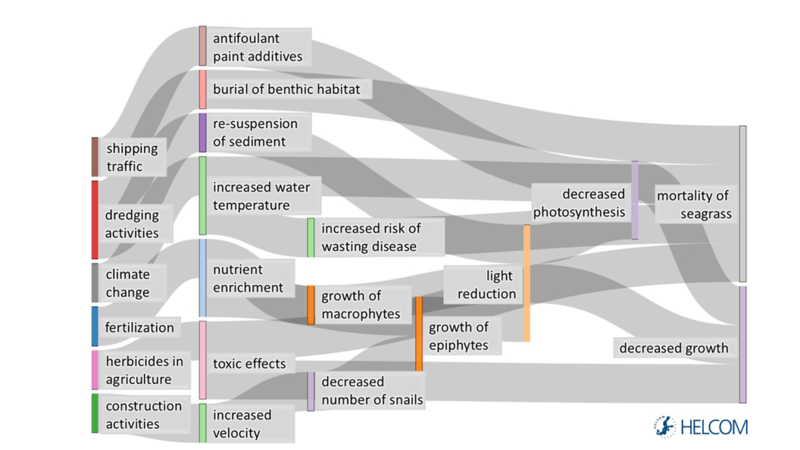 Effects of selected human activities on blue mussels to show the linkage framework. Based on systematic literature review using the LiACAT tool (HELCOM 2016f, Eilers et al. 2018). Deterioration of marine biodiversity may result in welfare losses to society (See Chapter 3 Human welfare and ecosystem health). Although the effects may not be directly observable, people obtain benefits from knowing that the marine ecosystem and its species are thriving. The value for biodiversity is, for the most part, independent of the use of the marine environment, and more related to the knowledge that habitats and species exist and are in good health. Improved biodiversity and marine health brings about increased economic benefits to citizens, which are lost if the state of the sea does not improve (cost of degradation). Some of these monetary benefits have been assessed in a stated preference choice experiment study carried out in Sweden, Finland and Lithuania in 2011, which elicited citizens’ willingness to pay for improvements with regard to aspects related to marine biodiversity (Kosenius and Ollikainen 2015). The valuation study estimated the benefits from increasing the amount of healthy perennial vegetation (such as underwater meadows) and the size of fish stocks in the Finnish-Swedish archipelago and the Lithuanian coast from current to good status. The benefits were based on people’s willingness to pay for these improvements. As the study was conducted only in three countries, the benefit estimates had to be transferred to the six other Baltic Sea countries to arrive at a regional estimate. Thus, only the estimates for Finland, Lithuania and Sweden are based on original valuation studies and data collection, and the estimates for Denmark, Estonia, Germany, Latvia, Poland and Russia are based on value transfer. The transferred value estimates were corrected for differences in price and income levels between the countries. The Finnish benefit estimate was transferred to Denmark and Germany, and the Lithuanian estimate to Estonia, Latvia, Poland and Russia. The choice of which estimates to transfer, and where to, was made based on average income levels. Figure B5.6.1 shows the estimates per person. The results suggest that citizens’ welfare would increase by 1.8–2.6 billion euros annually in the Baltic Sea region, if the state of the perennial vegetation and fish stocks improved to a good status (See also Thematic assessment: HELCOM 2018A). It is worth noting that there is more uncertainty about these estimates compared to the estimates for eutrophication and recreation, as some of the values are based on benefit transfer. Figure B5.6.1. Benefit losses related to perennial vegetation and fish stocks. Note that estimates for Finland, Lithuania and Sweden are based on original valuation studies and data collection, and estimates for the six other countries are based on value transfer from Finland (Denmark and Germany) and Lithuania (Estonia, Latvia, Poland and Russia). The range comes from the 95 % confidence intervals for the value estimates reported in the original study. Value estimates are in purchasing power parity adjusted 2015 euros. Source: Kosenius and Ollikainen (2015). A HELCOM core indicator to assess the number of drowned mammals and waterbirds caught in fishing gear is undergoing further development. Drowning in fishing gear is believed to be the greatest source of mortality for harbour porpoise populations in the Baltic Sea, and is also a concern for seals (Core indicator report: HELCOM 2018ar). The risk of incidental by-catch is highest in various types of gillnets but other stationary fishing gear, such as fyke nets and push-up traps also have incidental by-catches (ICES 2013a, Vanhatalo et al. 2014). Incidental by-catches of harbour porpoise in the Kattegat and Belts Seas were calculated at 165 to 263 animals in 2014, based primarily on information from CCTV cameras on commercial vessels in combination with data on fishing (ICES 2016d). However, the numbers are associated with high uncertainties, concerning both incidental by-catch numbers and the amount of fishing activity taking place. Documentation of incidental by-catch of harbour porpoise in the Baltic Proper is fragmented, typically amounting to a few animals per year from the countries that are reporting by-catch of this species. However, dead harbour porpoises showing signs of having been entangled in gillnets are found and reported regularly, so it is likely that by-catch in gillnets is adversely affecting the critically endangered central Baltic Sea population (ICES 2017a). The annual incidental by-catch of grey seals in trap nets and gill nets was estimated at around 2,180- 2,380 seals in 2012, based on interviews with fishermen from Sweden, Finland and Estonia, and accounting for the variability in seal abundance, fishing activity, and underreporting (Vanhatalo et al. 2014). There are no estimates of the incidental by-catch of ringed seals or harbour seals. Eel (Anguilla anguilla) has been a common species across the Baltic Sea historically, occurring even in the far north. With a common recruitment area in the Sargasso Sea all eel in Europe and the Mediterranean are part of the same (panmictic) population, occurring in scattered marine, coastal, river and lake ecosystems. Eel is listed as critically endangered (HELCOM 2013b). A main concern is that the recruitment of eel has decreased sharply since the 1980s (Moriarty and Dekker 1997, ICES 2016c). Probably, a decreasing trend has been present even longer (Dekker and Beaulaton 2016). Eel is subject to many pressures in its natural environment, and the recent declines can likely be explained by a combination of several factors, including overfishing, inland habitat loss and degradation, mortality in hydropower turbines, contaminants, parasites and climatic changes in the spawning area (Moriarty and Dekker 1997, ICES 2017f). The status of the eel stock has been poorly documented until recently, with incomplete catch statistics being one issue. There are indications that the eel in the Baltic Sea constitutes about a quarter of the total population of European eel today. Fishing yield all over Europe has gradually diminished since the mid-1900s, and is now below 10 % of the quantity caught in the past. In the Baltic Sea, there is a decreasing number of licensed fishermen targeting eel, and there have been efforts to ban recreational fishing and to decrease the number of licensed fishers (ICES 2016c). In 2007, the EU eel regulation implemented a distributed control system, setting a common restoration target at the international level, and obliging EU countries to implement the required protective measures. The aim is to ensure that 40 % of mature eels make it to the sea, in relation to estimated pristine conditions. The required minimum protection has not yet been achieved, and although eel management plans are being established on a national level, no joint management and assessment actions have been achieved. Eel has recently been included in Appendix II of the Convention of Migratory Species, and they are also conserved through the EU Habitats Directive. Physical loss is defined as a permanent change of seabed substrate or morphology, meaning that there has been change to the seabed which has lasted or is expected to last for a long period (more than twelve years (EC 2017a). The following activities were considered in the assessment as potentially causing loss of seabed: construction at sea and on the shoreline (including cables and pipelines, marinas and harbours, land claim, mariculture, extraction of sand and gravel, and dredging) (Figure 4.7.1). Physical disturbance is defined as a change to the seabed which can be reverted if the activity causing the disturbance ceases (EC 2017a). The same activities as in the assessment of physical loss, and trawling, were considered as causing physical disturbance (acting via the pressures of siltation, smothering, and abrasion). In addition, shipping was included as potentially causing physical disturbance (Figure 4.7.1). The potential extent of loss and disturbance of the seabed was estimated by identifying the spatial distribution of human activities exerting these pressures. The extent of pressures was estimated based on information from literature, and the data sets were aggregated into two layers, representing physical loss and physical disturbance, respectively. Whether an activity in reality leads to loss of or disturbance of habitats depends on many factors, such as the duration and intensity of the activity, the technique used and the sensitivity of the area affected. The identification of which activities lead to loss and/or physical disturbance is still under development and therefore the categorisations used up to now are preliminary. The aggregated layers were also compared with information on the spatial distribution of broad benthic habitat types, in order to estimate the potentially lost and disturbed areas of benthic habitats For more information, see the thematic assessment; HELCOM (2018E). The results are presented descriptively as an indication of the potential extent of the pressure. However, no threshold values are defined for physical loss and disturbance and thus no value judgement of status is placed on the results. Confidence in the assessment has not been calculated because the data layers include only information on which potential pressures are present, while their absence according to the data may reflect a true absence or missing information. Therefore the potential loss and disturbance can be underestimated in some sub-basins due to lack of data on specific pressures. It is however possible to qualitatively evaluate gaps in the pressure layers based on knowledge of the national data sets that are underlying the Baltic wide layers. The data layers used in this assessment include all layers listed in HELCOM (2018E). Fishing mortality was assessed in relation to the level estimated to deliver a long term maximum sustainable yield, referred to as FMSY, based on analytical assessment models. The assessment of spawning stock biomass is made in relation to the associated reference value ‘MSY B-trigger’ (ICES 2017a). No assessment is yet available for the age and size distribution. The assessment results presented here give the average results for the years 2011 to 2016, using reference values from 2016 (Box 4.6.1). Proxy reference points are used for some data-limited stocks. For stocks where sufficient data for an analytical assessment are lacking, ICES provides fisheries advice based on historical data on catches, recruitment, harvest rate and biomass. For the migratory species, ICES gives advice on salmon (Salmo salar) individually by for each river stock, using a different framework for setting reference values in relation to MSY (ICES 2017d-e), and qualitative overviews for sea trout (ICES 2017f). Results for the HELCOM core indicators on salmon and sea trout (Salmo trutta) are shown in Chapter 5.3 Fish. Species which are found and fished in the Baltic Sea, but for which the Baltic Sea fisheries have limited importance are not included, such as mackerel (Scomber scombrus), horse mackerel (Trachurus trachurus), ling (Molva molva), saithe (Pollachius virens) and anchovy (Engraulidae), nor commercial species in coastal and transitional waters which are assessed nationally. Cod (Gadus morhua) is mainly fished by demersal trawls reaching the seabed. It is also fished with gillnets, often with a by-catch of flatfish, which is also utilised. In times of low cod quotas and high flatfish abundances, flatfishes can become the key target species, especially dab (Limanda limanda) and flounder (Platichthys flesus). Pelagic commercial species are almost exclusively sprat (Sprattus sprattus) and herring (Clupea harengus), and are mainly fished by pelagic trawls, in the water column. Salmon (Salmo salar) is caught by long lines during its feeding stage in the sea, or by trap nets or gill nets during their spawning run, and salmon fishing is also sometimes allowed in river mouths. Drift nets have been fully banned in the Baltic Sea since 2008. The coastal fisheries use mainly gill nets, pound nets, trap nets, and in some areas Danish seines. A variety of species are targeted, depending on season and availability, including herring, cod and flounder and coastal freshwater species such as pikeperch (Sander lucioperca) and perch (Perca fluviatilis). Demersal trawling occurs in some coastal areas, but is forbidden in the coastal zone in many of the Baltic countries. The term ‘microlitter’ is used for litter particles smaller than 5 mm, but they can also be much smaller (GESAMP 2015). Some studies have focused on particles as small as 20 or even 10 µm. The particles can be synthetic and non-synthetic particles, such as plastic, cellulose, cotton, wool, rubber, metal, glass, combustion particles. Microlitter particles can originate from land-based sources, for example via waste water, but they are also created at sea during the breakdown of larger litter items or by tearing from equipment used for maritime activities (Lassen et al. 2015, Welden and Cowie 2017). Microlitter has been detected inside species in all levels of the food web and may be found in all parts of the environment; on the water surface, within the water column, on the seafloor and shore (Lassen et al. 2015). Particles with low density, such as many common plastic types, can also reach the seafloor, by being incorporated in marine snow, attached to sinking detritus, or when they are covered with biofilms which increase their density and hydrophobic state. Monitoring of hazardous substances takes place in three types of matrices, namely biota, water and sediment. Each of these has specific threshold values defined for each substance (or substance group). Primary threshold values identify the matrix deemed to be most appropriate for monitoring the specific substance or substance group, though secondary threshold values are commonly established and used where monitoring in the primary matrix is not available. If several threshold values are available, thresholds based on environmental quality standards (EQS) and the sampling matrix biota are preferred. Monitoring of biota reflects the accumulation of contaminants in the living environment. The environmental quality standard (EQS) values are used by HELCOM countries that are also EU Member States for the classification of chemical status of water bodies under the Water Framework Directive, at concentrations below this level it is assumed that no harm will be caused to the freshwater or marine environment. Background assessment criteria (BAC) have been developed to illustrate progress towards background concentrations of naturally occurring substances, and close to zero concentrations for man-made substances. Using background concentrations of naturally occurring substances as the threshold value may represent an even more precautionary approach than the use of other threshold values devised to indicate no environmental harm. Foodstuff threshold values stem from legislation of the European Union (EC 2006). The aim is to ensure human health is not detrimentally impacted. Foodstuff threshold values do not cover all combinations of matrices and contaminants relevant for an environmental assessment of the marine environment. Adaptation to climate change is a central issue for the planning and implementation of measures to reduce nutrient inputs, as well as for adjusting the level of nutrient input reductions to ensure protection of the Baltic Sea marine environment in a changing climate. For example, the maximum allowable inputs are calculated under the assumption that Baltic Sea environmental conditions are in a biogeochemical and physical steady-state. This assumes that the environment will reach a new biogeochemical steady state under the currently prevailing physical steady state, after some time when the internal sinks and sources have adapted to the new input levels. This assumption is not likely to last with a changing climate, as the physical environment is also changing and will feedback upon the biogeochemical cycling, for example by enhancing growth and mineralization rates. Simulations indicate that climate change may call for additional nutrient input reductions to reach the targets for good environmental status of the Baltic Sea Action Plan (Meier et al. 2012). Effects from climate change and input reductions will both take substantial time, and a deepened understanding of the development is needed to support management. Examples of use values are opportunities for and enjoyment from marine and coastal recreation. Non-use values stem from knowing that the marine environment is healthy and available to others in the same and future generations, for example. Reaching a good eutrophication status for the Baltic Sea will bring about increased human welfare and economic benefits to citizens in the coastal countries. The benefits that are lost if the Baltic Sea does not reach a good environmental status are called the cost of degradation. The monetary benefits of reducing eutrophication have been assessed in a Baltic-wide stated preference contingent valuation study in 2011 (Ahtiainen et al. 2014). The results represent the value of reaching good eutrophication status in the Baltic Sea, based on citizens’ stated willingness to pay, in a survey for achieving the target status. The study captured a variety of eutrophication effects, including water clarity, cyanobacterial blooms, underwater meadows, fish species composition and oxygen deficiency at the sea bottom. The change in eutrophication was described using all of these effects. The study covers all nine coastal countries and considers a change in the condition of the entire Baltic Sea. The target state in the study corresponds closely to that of achieving a good environmental status of the sea, stating that all sub-basins except the Northern Baltic Proper have achieved good status. The time frame in the study is somewhat longer than in current policies, as it is set to the year 2050. Reaching a good status earlier than 2050 might bring about even greater benefits, as people generally place more value on goods and services that they obtain sooner. Figure B4.1.2 presents the estimates of how benefits would be lost if eutrophication is not reduced in the Baltic Sea. The total losses are estimated at 3.8–4.4 billion euros annually for the Baltic Sea region. In other words, citizens’ welfare would increase by this much each year if good eutrophication status was achieved. See also Thematic assessment on economic and social analyses: HELCOM 2018A. Figure B4.1.2. 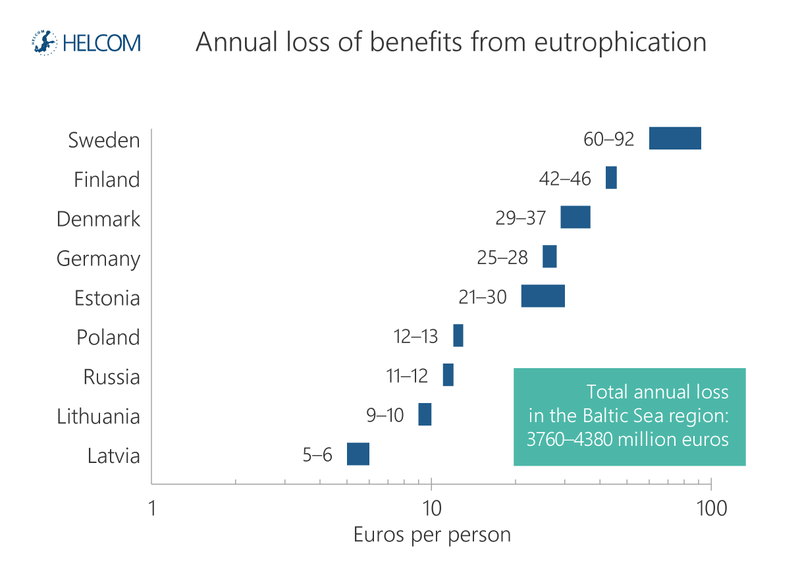 Annual benefit losses from eutrophication (euros per person) and total in the Baltic Sea region (million euros). The ranges show the 95 % confidence intervals for the value estimates reported in the original study. Value estimates are in purchasing power parity adjusted 2015 euros. Source: Ahtiainen et al. (2014). HELCOM has been a major driver in the regional approaches to reduce nutrient loads to the Baltic Sea. The management of Baltic Sea eutrophication has been advanced with the Baltic Sea Action Plan (HELCOM 2007), which includes a complete management cycle aiming for specified improved conditions in the Baltic Sea, based on the best available scientific information and a model-based decision support system. Core indicators with associated threshold values representing good status with regard to eutrophication are established primarily from monitoring data, which are interpreted through statistical analysis. The threshold values applied in this assessment were in most cases established based on scientific proposals from the HELCOM TARGREV project (HELCOM 2013d), where statistical breakpoints were identified from historical datasets and hindcast model simulations extending back to the beginning of the 1900s. The scientific proposals were adjusted by HELCOM experts based on other relevant information, such as Water Framework Directive class boundaries in coastal waters, and adopted by the HELCOM Heads of Delegation (HELCOM 2012b and others; see also Thematic assessment: HELCOM 2018B). In a following step, the relationships between changes in the inputs of nutrients to the Baltic Sea and the core indicators are established by physical-biogeochemical modelling. These relationships differ across sub-basins because of differences in water circulation, ecosystem characteristics, and inputs, for example. The model results give estimates of the maximum allowable input of nutrients to the different sub-basins in order for the core indicators to achieve their threshold values over time, recognizing that this might take many years. The input reductions necessary to reach the basin-wise maximum inputs of nutrients are allocated to the HELCOM countries as country-wise reduction targets. In addition, certain reduction potential is indicated for upstream countries and distant sources (HELCOM 2013d). The allocation is done according to the ‘polluter pays’ principle of the Helsinki Convention. Progress in reaching nutrient reduction targets is evaluated based on annual compilations of the nutrient inputs to the Baltic Sea (HELCOM Pollution Load Compilation). Marine and coastal recreation is an activity which is dependent on the state of the Baltic Sea environment. Thus, it is possible to assess both the current economic value of recreation, and the losses in recreation values due to the deterioration of the marine environment. Results are available from a recent extensive study on Baltic Sea recreation that covers all coastal countries (Czajkowski et al. 2015). The value of current Baltic Sea recreational visits represents the economic benefit from the activity. The estimates are based on information about travel costs and the number of recreational visits people make to the Baltic Sea and its coast. They measure the total value of Baltic Sea recreation visits during a year. The total recreational benefits of the Baltic Sea are around 15 billion euros annually (Figure B3.4.1). Figure B3.4.1. Annual value of marine and coastal recreation and average number of annual recreational trips to the Baltic Sea. Data from the year 2010. Source: Czajkowksi et al. (2015). The losses in value of Baltic Sea recreation, due to deterioration of the marine environment, are measured based on a change in citizens’ recreation values from a one-step change in the perceived status of the Baltic Sea marine environment. The perceived environmental status was measured on a 5-step scale from ‘very bad’ to ‘very good’, with the average being ‘neither bad nor good’, and thus, a one-step change means an improvement from ‘neither bad nor good’ to ‘rather good’. The change in recreation values stems from the predicted change in the expected number of trips to the Baltic Sea when the perceived environmental conditions change, based on econometric modelling. The losses of recreation values due to the deterioration of the marine environment are estimated to be 1–2 billion euros annually (Figure B3.4.2). Figure B3.4.2 Lost recreation benefits due to deterioration of the marine environment. 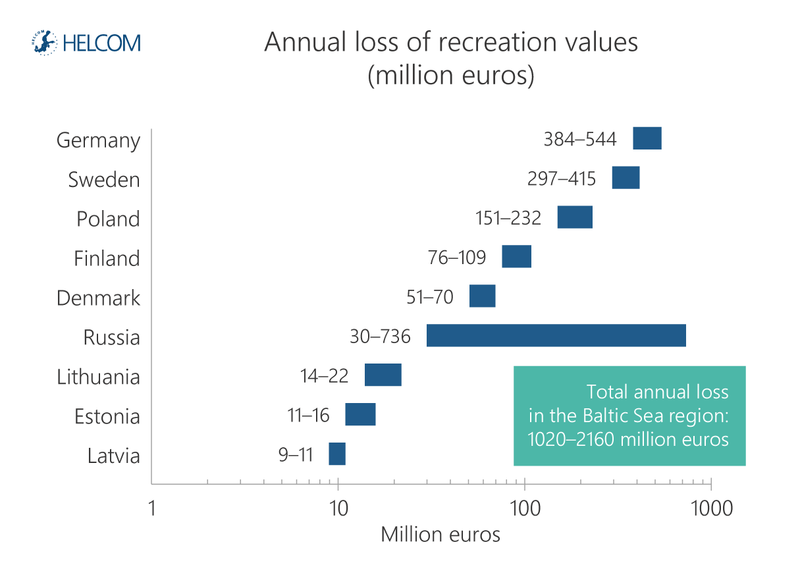 The total losses of recreation values are 1–2 billion euros annually for the Baltic Sea region. Value estimates are in purchasing power parity adjusted 2015 euros. Source: Czajkowski et al. (2015). This extensive study is an example of the necessity and importance of economic valuation studies that cover all coastal countries, but further studies are needed across all countries before the results of the assessment can form a basis for the socioeconomic value of recreation in the Baltic Sea region. The ecosystem services approach allows for a holistic analysis of the links between the status of the ecosystem and human well-being, and is not limited to market based information. Linking economic indicators, for example ‘value added’, with the ecosystem services approach, we can explore how human activities benefit from and impact on the environment in a more comprehensive way. The graph shows the results of this method applied in Sweden (Fig. B3.3.1). Figure B33.1. Example on how human activities benefit from an impact on the environment. The bubble sizes represent the value added of each activity. 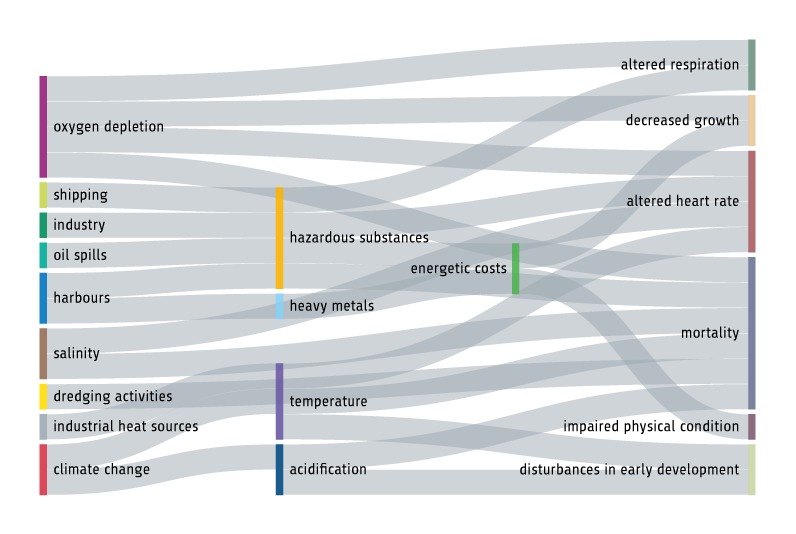 The vertical axis represent the total environmental impact of human activities on the ecosystem services, and the horizontal axis represent the activities dependency on the state of ecosystem services. Economically and ecologically sound marine management would shift the location of the bubbles downward and increase the size of the bubbles. The result of this method is expected to vary from country to country. Degradation of the environment causes multiple adverse effects that reduce the economic benefits (or welfare) that people obtain from the marine environment, including increased water turbidity and more frequent cyanobacterial blooms, reduction and changes in fish stocks, contamination of fish and seafood, increased litter on the beaches and in the sea, and loss of marine biodiversity. 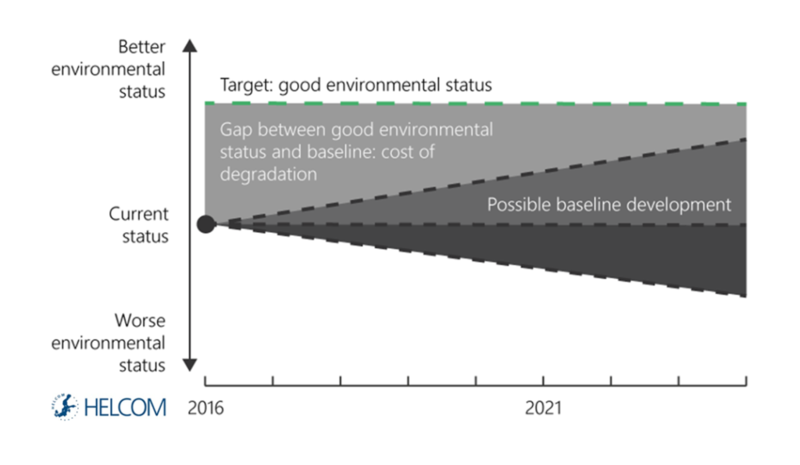 The economic benefits that are lost if the sea does not reach a good environmental status are called the cost of degradation (see Figure B3.2.1). The losses in human welfare can be assessed in monetary terms based on economic valuation studies that estimate the effect on citizens’ benefits from changes in the quality of the marine environment. It is important to acknowledge the related uncertainties when using such value estimates. For example, a citizen’s perceptions of changes in the quality of the marine environment can be unclear, nevertheless, the value estimates can be used as a proxy for the cost of degradation. When estimating, the focus can be either on degradation themes, such as eutrophication, or ecosystem services, such as recreation. Various methodological approaches and assessment results are available for estimating losses in human welfare. When no such data are available for a certain country or region, value transfer is an example of how to relate existing individual evaluation to entire marine region. Results from currently available analyses are presented in this chapter for recreation (Box 3.4), eutrophication (chapter 4, section 4.1 Eutrophication, Box 4.1.2 at the bottom of the page) selected biodiversity aspects (chapter 5, section 5.6 Biodiversity summary and food web aspects, Box 5.6.1 at the bottom of the page; see also HELCOM 2018A). Figure B3.2.1. Illustration of the cost of degradation concept. 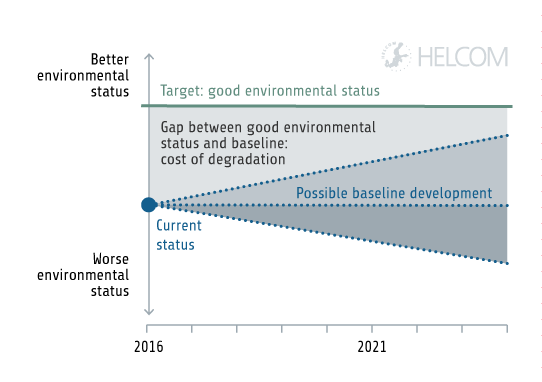 Cost of degradation results from the difference between the current/baseline environmental status and the good environmental status. Economic and social analysis of the use of marine waters examines the economic contribution to regional and national economies from using marine waters in their current state. This contribution is measured with economic and social indicators. These indicators describe the importance of the marine activities to the economy, for example by estimating ‘value added’ or ‘employment’, or the direct economic value from the use of the marine environment to the citizens’ living in the coastal countries. In this report, the information is derived mainly from existing statistics, except for marine and coastal recreation, where statistics are complemented with data on economic value to citizens. The indicators do not capture the negative economic impacts that marine uses may have on the quality of the marine environment and thus potentially on other uses of the marine environment, but are a piece of the overall picture of how society and the marine environment are linked. Further improving our understanding of the economic contribution from marine activities will require harmonised data across all coastal countries, reporting data separately for different sea areas (Baltic and North Seas), and differentiating between land activities, freshwater activities and marine activities, particularly for tourism. This assessment uses core indicators to measure the status of the Baltic Sea marine environment on the basis of selected and representative elements. The HELCOM core indicators cover both biodiversity and human induced pressures and impacts on the Baltic Sea ecosystem. The core indicators were selected according to a set of principles including ecological and policy relevance, measurability with the monitoring data and linkage to anthropogenic pressures (HELCOM 2013c). The HELCOM core indicators evaluate the observed status in relation to a regionally agreed threshold value, in many cases using data from regionally coordinated monitoring. Hence, the results indicate whether status is good or not according to each of the core indicators. Furthermore, integrated assessments of biodiversity, eutrophication and hazardous substances, are made based on the core indicators using the BEAT, HEAT and CHASE assessment tools. The integrated tools were also used in the initial holistic assessment (HELCOM 2010a) and have been developed further in the second holistic assessment. The integrated assessments do not only show whether status is good or not, but also indicate the distance to good status by use of five categories; two representing good status and three representing not good status. The assessments are performed at the spatial scale of HELCOM assessment units, which have four different levels; each core indicator being assessed at its most relevant scale. For example, birds are assessed at level 1 which is the whole region, salmon and sea trout, as well as zooplankton are assessed at level 2 which further subdivides the Baltic Sea into sub-basins. Level 3 separates the sub-basins also into coastal and offshore areas, and level 4 uses a finer subdivision of coastal areas, in line with national management practices such as water bodies as designated under the EU Water Framework Directive. The assessment is based on currently available core indicators. For some elements, operational indicators are still lacking or limited such as for benthic and pelagic habitats, health of marine mammals and food webs. The further development of core indicators to reach a more complete assessment is a prioritised HELCOM activity. Over 30 indicators form the basis for the status assessment, reflecting key aspects of the health of the Baltic Sea ecosystem and providing a quantitative basis for status evaluation and management agreements. HELCOM will continue developing indicators for the purpose of assessment and policy evaluation for the next holistic assessment. The HELCOM Integrated assessment tools for eutrophication, hazardous substances and biodiversity have been advanced for this assessment, and will be used and developed further in the future. The assessment of cumulative impacts, using the Baltic Sea Impact Index, has improved considerably since its first regional use (HELCOM 2010a). 96 spatial data sets representing human activities, pressures and ecosystems components have been produced, and all the results are available for further use, including in maritime spatial planning. The State of the Baltic Sea report has taken steps to further develop socioeconomic aspects within the assessment framework, integrating the human aspect and providing a better basis for understanding benefits of environmental management. The coordinated regional economic and social assessments will be continued in HELCOM and developed to include mapping, valuation, and analysis of ecosystem services and natural capital accounting, taking advantage of improved methods and comparability of data. The Baltic Sea Action Plan and the Marine Strategy Framework Directive have similar goals and objectives, and thus, progress towards achieving the same regional aim, which can be assessed using the same indicators and tools. The ‘State of the Baltic Sea’ report covers the topics addressed by the four segments of the Baltic Sea Action Plan and its follow-up Ministerial Declarations, as well as the descriptors of the Marine Strategy Framework Directive. The assessment is organised according to Pressures on the environment (Chapter 4) and the status of Biodiversity and food webs (Chapter 5). The indicators used in the respective sub-chapters are listed in Table B.1.3.1 and Table B.1.3.2. Marine litter and underwater sound are new components of the Baltic Sea Action Plan, taken up by HELCOM in the Ministerial Declarations (Moscow, 2010 and Copenhagen, 2013). The EU Marine Strategy Framework descriptor related to the removal of commercial fish and shellfish can be associated with the provisions of 2013 HELCOM Declaration on ecosystem-based fisheries, while hydrological conditions cannot be directly assigned to any segment of the Baltic Sea Action Plan. Maritime activities, which is a focal area of HELCOM and one of the four BSAP segments, is linked to several of the descriptors, including eutrophication, contaminants, and non-indigenous species. Table B.1.3.1. Indicators used in Chapter 4 of this report (‘Pressures’), and their relation to the segments of the Baltic Sea Action Plan (BSAP) and the descriptors of the Marine Strategy Framework Directive (MSFD). An asterisk (*) denotes that the indicator or threshold values have not been fully adopted in HELCOM yet and are currently tested. Indicators in italics are under development in HELCOM and at this time are only included descriptively in the report. The indicators are presented by the segments of the Baltic Sea Action Plan: Eutrophication (green), Hazardous substances (purple) and Maritime activities (orange), and the follow-up declarations (burgundy). All indicators on eutrophication and hazardous substances are also relevant for the maritime segment of the Baltic Sea Action Plan. Beach litter Continuous low frequency anthropogenic sound Fishing mortality No indicator. Descriptive approach. Table B.1.3.2 Indicators used in Chapter 5 of this report (‘Biodiversity’), relating to the biodiversity segment of the Baltic Sea Action Plan (BSAP) and descriptor 1 of the Marine Strategy Framework Directive (MSFD). An asterisk (*) denotes that the indicator or threshold values have not been fully adopted in HELCOM yet and are currently being tested. Indicators in italics are under development in HELCOM and at this time are only included descriptively in the report. One person or activity alone does not exert much pressure on the environment, but when scaled up the impact of many humans and their activities may have a considerable impact on marine species, and the different impacts act together on the environment. 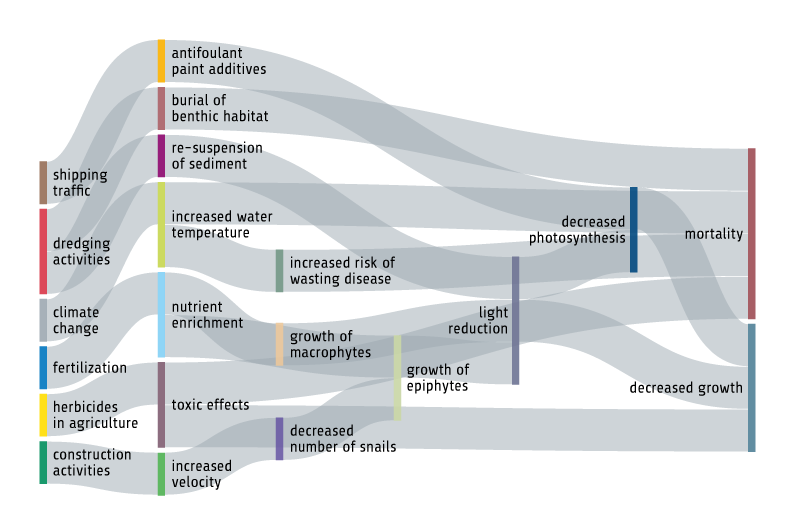 Additionally, single or cumulative impacts might trigger changes in the food web, with potential cascading effects further up or down in the food web. Some species migrate far and encounter several different environments and different types of pressures during their life. Other species are local and cannot move, even if the local environment changes, and the water masses around them have travelled long distances and may include harmful substances from sources far away. The status of pressures, species and habitats is influenced by multiple connections to human activities. The linkages between human activities and pressures are outlined in Chapter 3 Humans & the ecosystem, and the impacts of current pressures in the Baltic Sea on species and habitats are assessed using the Baltic Sea Impact index in Chapter 6 Cumulative impacts on the marine environment. Understanding these linkages also helps reveal important knowledge gaps for setting management targets and helps us to better understand how human activities depend upon, and benefit from, marine ecosystem services. Salmon eggs hatch in rivers with outflows into the Baltic Sea and spend the first parts of their lifecycle there, feeding on invertebrates and being dependent on the river water environment. 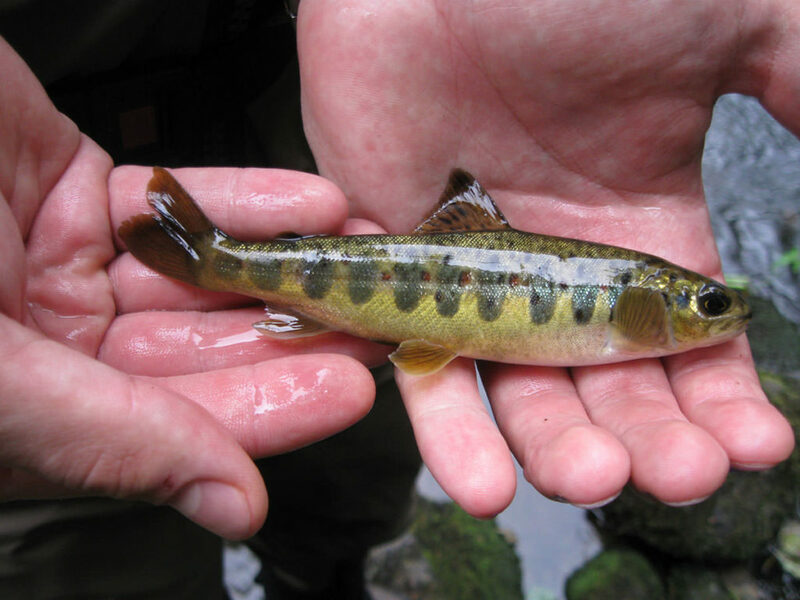 After one or two years they grow into so called smolt and migrate to the Baltic Sea, where they mature into adult salmon and remain for a few years. During this time, a salmon may migrate hundreds of kilometres and encounter many different environments before returning to the river to spawn. Its health and survival is influenced by food availability, fishing pressures, and potentially also underwater sound, marine litter and the quality of available food, and it is dependent as well on the environmental quality of their spawning rivers. Photo: Esa Lehtinen. Bladderwrack is an important habitat-forming seaweed which colonises hard substrates in the Baltic Sea. In other seas it lives in the intertidal zone, but in the Baltic Sea it lives continuously submerged. Many small animals thrive among the structures formed by the seaweed, and it is a productive environment for small fish and benthic species. These small animals are also important for keeping the seaweed clean. The bladderwrack lives attached to the rock or other hard substrate all its life. It is sensitive to the quality of the surrounding water and hence eutrophication or changes in the food web can be damaging. When food webs are disturbed, due to a decrease of big predatory fish for example, this may also affect the number of small animals among the seaweed and the quality of this habitat. Photo: Nicklas Wijkmark. Oxygen conditions in the deep water have been improved by a series of inflow events since the end of 2013. A series of smaller inflow events occurred in November 2013, December 2013, and March 2014. These interacted positively and reached the deep water of the central Baltic Sea for the first time since 2003 (Naumann and Nausch 2015). In December 2014, a very strong inflow occurred, which transported 198 km³ of saline water into the Baltic Sea (Mohrholz et al. 2015), and was followed by smaller events. A Major Baltic Inflow of moderate intensity also occurred between 14 and 22 November 2015, followed by a third moderate Major Baltic Inflow between 31 January and 6 February 2016 (Feistel et al. 2016). These events caused intensified oxygen dynamics in the Arkona Basin, Bornholm Basin, and Eastern Gotland Basin, and the northern Baltic Proper was affected up to the end of 2016. As a result, the near bottom oxygen concentrations in the Bornholm deep ranged from 0.08 ml/l (in November 2015) to 5.4 ml/l (in February 2015), measured at 95 m water depth. In the Gotland deep, where hydrogen sulphide was present in concentrations corresponding to a negative oxygen content of -8.75 ml/l (in November 2013), oxygen concentration increased to 2.9 ml/l in April 2015 at 235 m depth (Nausch et al. 2016). Maximum ventilation occurred in May 2016. The major Baltic inflow of December 2014 caused the Bornholm Basin to become fully ventilated. Hydrogen sulphide was absent in the Gdansk Basin and Eastern Gotland Basin, and the former anoxic bottom water was replaced (see Figure 1.10). The recent inflows have reduced the large pool of hydrogen sulphide that was present in the Eastern and Northern Gotland Basin. However, oxygen concentrations in the deep water are near zero below the permanent stratification and conditions near the bottom have become increasingly anoxic during 2017. There are signs of increasing amounts of hydrogen sulphide in the Eastern and Northern Gotland Basins close to the bottom. In order to prevent further deterioration of the oxygen situation, with the formation of hydrogen sulphide concentrations, new major inflows are needed (Hansson et al. 2017). Adaptation to climate change is a central issue for the planning and implementation of measures to reduce nutrient inputs, as well as for adjusting the level of nutrient input reductions to ensure protection of the Baltic Sea marine environment in a changing climate. For example, the maximum allowable inputs are calculated under the assumption that Baltic Sea environmental conditions are in a biogeochemical and physical steady-state. This assumes that the environment will reach a new biogeochemical steady state under the currently prevailing physical steady state, after some time when the internal sinks and sources have adapted to the new input levels. Within a changing climate this assumption will not hold, as the physical environment is also changing and will feedback upon the biogeochemical cycling, for example by enhancing growth and mineralization rates. Simulations also indicate that climate change may call for additional nutrient input reductions to reach the targets for good environmental status of the Baltic Sea Action Plan (Meier et al. 2012). Effects from climate change and input reductions will both take substantial time, and a deepened understanding of the development is needed to support management. Reaching a good eutrophication status for the Baltic Sea will bring about increased human welfare and economic benefits to citizens in the coastal countries. The benefits that are lost if the Baltic Sea does not reach a good environmental status are called the cost of degradation. The monetary benefits of reducing eutrophication have been assessed in a Baltic-wide stated preference contingent valuation study in 2011 (Ahtiainen et al. 2014). The results represent the value of reaching good eutrophication status in the Baltic Sea, based on citizens’ stated willingness to pay in a survey for achieving the target status. The study captured a variety of eutrophication effects, including water clarity, cyanobacterial blooms, underwater meadows, fish species composition and oxygen deficiency at the sea bottom. The change in eutrophication was described using all of these effects. Figure B4.1.2 presents the estimates of how benefits would be lost if eutrophication is not reduced in the Baltic Sea. The total losses are estimated at 3.8–4.4 billion euros annually for the Baltic Sea region. In other words, citizens’ welfare would increase by this much each year if good eutrophication status was achieved. See also Supplementary report: HELCOM 2017A. HELCOM has been a major driver in the regional approaches to reduce nutrient loads to the Baltic Sea. The management of the Baltic Sea eutrophication has been advanced with the Baltic Sea Action Plan (HELCOM 2007), which includes a complete management cycle aiming for specified improved conditions in the Baltic Sea, based on the best available scientific information and a model-based decision support system. Table B3.1 test. Testing a regular table. Table 4.3.3 test. Testing table with formatting. Table 5.5.1 test. Testing table with formatting and merged cells. Core indicators with associated threshold values representing good status with regard to eutrophication are established primarily from monitoring data, which is interpreted through statistical analysis. In a following step, the relationships between changes in the inputs of nutrients to the Baltic Sea and the core indicators are established by physical-biogeochemical modelling. These relationships differ across sub-basins because of differences in water circulation, ecosystem characteristics, and inputs, for example. The model results give estimates of the maximum allowable input of nutrients to the different sub-basins in order for the core indicators to achieve their threshold values over time, recognizing that this might take many years. The input reductions necessary to reach the basin-wise maximum inputs of nutrients are allocated to the HELCOM countries as country-wise reduction targets. In addition, certain reduction potential is indicated for upstream countries and distant sources (HELCOM 2013d). The allocation is done according to the ‘polluter pays’ principle of the Helsinki Convention. Progress in reaching nutrient reduction targets is evaluated based on annual compilations of the nutrient inputs to the Baltic Sea (HELCOM Pollution Load Compilations). Drowning in fishing gear is believed to be a strong pressure on the populations of divers, grebes, cormorants, alcids, mergansers and ducks, especially in wintering areas with high densities of waterbirds. Diving waterbirds are especially vulnerable to being entangled in gill nets and other types of nets, but incidental by-catches also occur in other types of fishing gear, such as longlines and traps (ICES 2013b). A rough estimate indicated that between 100 000 and 200 000 waterbirds drown annually in the North and Baltic Seas, of which the great majority drowns in the Baltic Sea (Žydelis et al. 2009, 2013, Bellebaum et al. 2012). Beside the assessment of incidental by-catch, the hunting bag (see Chapter 4.6 Species removal by fishing and hunting) must also be taken into account because the total anthropogenic mortality has to be related to the population in order to assess its impact. Drowning in fishing gear is believed to be the greatest source of mortality for harbour porpoise populations in the Baltic Sea, and is also a concern for seals (Core indicator report: HELCOM 2017ae). The risk of incidental by-catch is highest in various types of gillnets but other stationary fishing gear, such as fyke nets and push-up traps also have incidental by-catches (ICES 2013a, Vanhatalo et al. 2014). Incidental by-catches of harbour porpoise in the Kattegat and Belts Seas were calculated at 165 to 263 animals in 2014, based primarily on information from CCTV cameras on commercial vessels in combination with data on fishing effort (ICES 2016e). The numbers are however associated with high uncertainties, concerning both incidental by-catch numbers and estimates of fishing effort. Documentation of incidental by-catch of harbour porpoise in the Baltic Proper is only fragmented, typically amounting to a few animals per year from the countries reporting. Based on interviews with fishermen from Sweden, Finland and Estonia, and accounting for the variability in seal abundance and fishing effort, and also for underreporting, the annual incidental by-catch of grey seals in trap nets and gill nets in these countries were estimated at around 2 180 to 2 380 individual seals in 2012 (Vanhatalo et al. 2014). There are no estimates of the incidental by-catch of ringed seals or harbour seals. Population trends and abundance of seals: In order to have good status the population size needs to be above the limit reference level (10 000 individuals), and the species specific growth rate needs to be achieved. Seals are counted as the numbers of hauled-out individuals during moult. Distribution of seals: Considering the occurrence at haul-out sites and the range of seals at sea, good status is achieved when the distribution of the species is close to pristine condition. If pristine conditions cannot be achieved due to irreversible long-term environmental changes, then good status is achieved when all currently available haul-out sites are occupied. Nutritional status of seals: The core indicator is applied on grey seal, and evaluates the blubber thickness of a specimen of the population in relation to a defined minimum threshold value. Further, HELCOM is developing indicators on harbour porpoise abundance and distribution and number of drowned animals caught in fishing gear but at present there are no defined threshold levels against which the status can be assessed (Box 5.4.2). HELCOM is also aiming to develop health indicators for mammals, based on lung lesions (caused by parasites and bacteria) in harbour porpoise and harbour seals, and infections and ulcerations to the small intestine for grey seals. More details on the core indicator concepts and how threshold values have been defined can be found in the core indicator report. Historically, eel (Anguilla anguilla) has been a common species across the Baltic Sea, occurring even in the far north. With a common recruitment area in the Sargasso Sea all eel in Europe and the Mediterranean are part of the same (panmictic) population, occurring in scattered marine, coastal, river and lake ecosystems. The main concern regarding eel is its sharply decreased recruitment since the 1980s (Moriarty and Dekker 1997, ICES 2016). A decreasing trend has probably been present even longer (Dekker and Beaulaton 2016). The cause of recent changes may be a combination of factors such as overfishing, inland habitat loss and degradation, mortality in hydropower turbines, contaminants, parasites and climatic changes in the spawning area (Moriarty and Dekker 1997, ICES 2016d). In the Baltic Sea, there is a decreasing number of licensed fishermen targeting eel, and there have been efforts to ban recreational fishing and to decrease the number of licensed fishers (ICES 2016d). The status of the eel stock has been poorly documented until recently, with incomplete catch statistic being one issue. Indications are that the eel in the Baltic Sea constitutes about a quarter of the total population of European eel today. Since the mid-1900s, fishing yield all over Europe has gradually diminished and is now below 10% of the quantity caught in the past. In 2007, the EU Eel Regulation implemented a Distributed Control System, setting a common restoration target at the international level, and obliging EU countries to implement the required protective measures, with the aim of ensuring 40% of mature eels make it to the sea, in relation to estimated pristine conditions. The required minimum protection has not yet been achieved, and although eel management plans are being established on national level, no joint management and assessment actions have been achieved. Eel has recently been included in Appendix II of the Convention of Migratory Species, and are also conserved through the EU Habitats Directive. Major threats to seagrass result from nutrient inputs and habitat loss, the majority of which are from land such as from the oversupply of fertilisers or improperly treated waste water. 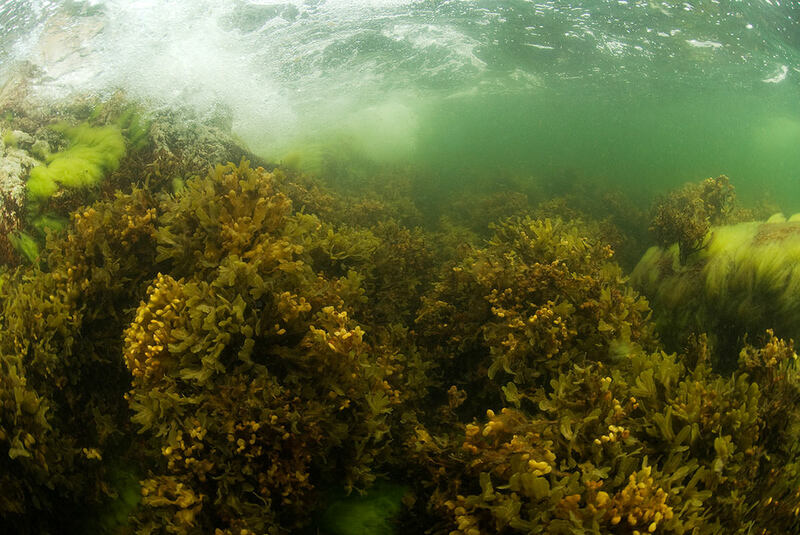 The increased nutrient levels favour phytoplankton and epiphytes growing on seagrasses, leading to overgrowth and shading and finally to a reduced biomass of seagrass. This effect can be exacerbated by increased current velocities, caused for example by construction activities: snails, normally grazing on seagrass for epiphytes and thus, mitigating the overgrowth effect, are washed away and disappear. Dredging activities bury seagrass and consequently have a direct impact. Additionally, re-suspension of sediments reduces light availability, leading to decreased photosynthesis and decreased growth. Some antifouling additives from ship coating reduces the photosynthetic efficiency of seagrass. Herbicides from agriculture may also affect seagrass and cause similar effects. Increased water temperatures caused by climate change not only affect growth and survival of seagrass but may also favour the spreading of pathogens, such as the potentially epidemic wasting disease which has been responsible for major seagrass declines in the past. Additional important pressures affecting seagrass meadows are for example oxygen depletion and increased sulphide concentrations, direct and indirect effects of fisheries, and acidification (Figure B.6.1.1). Figure B.6.1.1. Effects of selected human activities on seagrass meadows. Based on systematic literature review using the LiACAT tool (HELCOM 2016h). Blue mussels are sensitive to heavy metals and other pollution, since they are filter feeders and accumulate metals directly. Sources of contaminants are industries, land-based activities, air deposition, and activities at sea, such as harbours, shipping, industry, and oil spills. The defence mechanisms that are induced in the mussels are energetically costly for them, and alter heart rate and respiration. Additionally, physical condition is impaired, growth is reduced and mortality increases. The magnitude of these effects is dependent on environmental factors such as salinity, temperature and oxygen conditions. Changes in water temperature can be caused by local industrial heat sources or by climate change. In combination with acidification, effects on early development stages and on shell thickness have been observed. Moreover, shell growth and mortality are negatively affected by the interactive effects of reduced salinity and increased temperature. The dredging effects caused by fisheries activities may lead to decline of blue mussel by removal of species and abrasion of the seabed. The invasive species Crassostrea gigas is considered to compete with blue mussels and may alter the effects of anthropogenic pressures due to different tolerance levels towards the pressures (Figure B.6.1.2). Figure B.6.1.2. Effects of selected human activities on blue mussels to show the linkage framework. Based on systematic literature review using the LiACAT tool (HELCOM 2016h). Physical loss is defined as a permanent change of seabed substrate or morphology, meaning that there has been change to the seabed which has lasted or is expected to last for a long period (more than twelve years (EC 2017a). The following activities were considered in the assessment as causing loss of seabed: construction at sea and on the shoreline (also including cables and pipelines, marinas and harbours, land claim, and mariculture), sand and gravel extraction, dredging, and disposal of dredged matter (Figure 4.7.1). Physical disturbance is defined as a change to the seabed which can be reverted if the activity causing the disturbance ceases (EC 2017a). The same activities as in the assessment of physical loss were considered in the assessment as causing physical disturbance (acting via the pressures of siltation, smothering, and abrasion), and in addition shipping and trawling were included as potentially causing physical disturbance (Figure 4.7.1). Confidence in the assessment has not been calculated because the data layers include only information on which potential pressures are present, while their absence according to the data may reflect a true absence or missing information. Therefore the potential loss and disturbance can be underestimated in some sub-basins due to lack of data of specific pressures. It is however possible to qualitatively evaluate gaps in the pressure layers based on knowledge of the national data sets that are underlying the Baltic wide layers. The data layers used in this assessment include all layers listed in the supplementary report (HELCOM 2017D). It has been agreed to further consider the application of e.g. the layer on bathing sites and leisure boating in the updated version of the report. Cod is mainly fished by demersal trawls reaching the seabed. It is also fished with gillnets, often with a by-catch of flatfish, which is also utilised. Pelagic commercial species are almost exclusively sprat and herring, and are mainly fished by pelagic trawls, in the water column. Salmon is caught by long lines during its feeding stage in the sea, or by trap nets or gill nets during their spawning run, and salmon fishing is also sometimes allowed in river mouths. Drift nets have been fully banned in the Baltic Sea since 2008. The coastal fisheries use mainly gill nets, pound nets, trap nets, and in some areas Danish seines. A variety of species are targeted, depending on season and availability, including herring, cod and flounder and coastal freshwater species. Demersal trawling occurs in some coastal areas, but is forbidden in the coastal zone in many of the Baltic countries. The main source of pharmaceuticals to the Baltic Sea come from humans and animals, via urine and faeces, as well as the inappropriate disposal of unused medical products into sewers. Municipal wastewater treatment plants are considered a major pathway for introduction to the aquatic environment, with an estimated release of about 1.8 thousand tons of pharmaceuticals to the Baltic Sea. The fate and impacts of those pharmaceuticals in the environment is still largely unknown. During the period 2002 to 2013, pharmaceuticals were detected in about 14% of the water, sediment and biota samples in the Baltic Sea (HELCOM 2016c). The most frequently detected substances belong to the therapeutic groups of anti-inflammatory and analgesics, cardiovascular and central nervous system agents. In biota, the largest number of different pharmaceutical substances and the highest concentrations were found in blue mussels. A number of pharmaceuticals considered to be of special concern to the aquatic environment have been included on a ‘watch list’ under the EU Directive regarding priority substances in the field of water policy, and maximum acceptable detection limits have been proposed (European Commission 2013). Of the listed substances diclofenac was detected in 25% of the samples in the Baltic Sea, and failed the proposed maximum acceptable detection limit in 2% of the samples. The antibiotic claritromycin was detected in two out of 126 water samples and on one occasion in biota. Out of 228 water, sediment and biota samples, the hormones estradiol and 17a-ethinylestradiol were detected in three water samples. However, in many cases the analytical level of detection of the methods were not sensitive enough to give a result. HELCOM aims to develop core indicators for diclofenac concentration and estrogenic-like chemicals and effects. Environmental quality standard values in the field of water policy are set in directive 2008/105/EC of the European commission, amended in 2013 (EC 2008, 2013). These values are referred to as ‘EQS values’, and are set for priority substances with respect to concentrations in water, and for some substances also with respect to concentrations in biota (fish or shellfish). Values for sediments are not published there, but can be found in the EQS substance dossiers. The environmental quality standard values are used by EU Member States for the classification of chemical status of water bodies under the Water Framework Directive, and relate to an expected ‘safe’ level of exposure. Below this level, it is assumed that no harm will be caused to the freshwater or marine environment. Environmental quality standard values for water are used as threshold values in the core indicators for some substances. In these cases, the value relating to an annual average concentration is used. Monitoring in water can be challenging as the concentrations can be several orders of magnitude below the analytical detection limit. When measurements in biota are used, different trophic levels of the foodweb are analysed depending on the substance (for example, mussels or predatory fish are used), and different parts of the fish (for example fish muscle or measurements on the whole fish). Hence, the measured concentrations often need to be converted in order to conform to the environmental quality standard biota-value, which may introduce uncertainties. In this derivation, four principal matrices and protection goals are considered on the basis of toxicity tests with representative organisms; the pelagic community (‘QSwater’), benthic habitats (‘QSsediment’), top predators (‘QSbiota – secondary poisoning’), and human health through food consumption (‘QSbiota – human health’). A QS value can be used for the assessment provided that it corresponds to at least the same level of protection as the environmental quality standard. The value for the most sensitive of these matrices and protection goals is used. 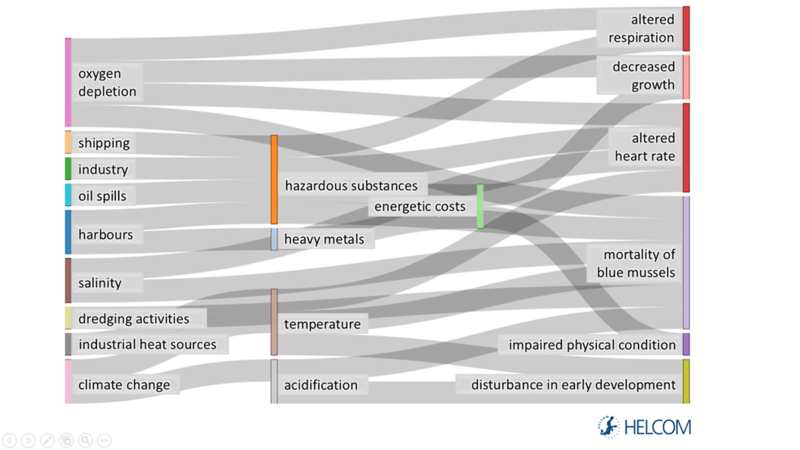 Background assessment criteria have been developed by OSPAR and ICES to define the background concentrations of naturally occurring substances, and close to zero concentrations for man-made substances. The defined values do not take ecotoxicological aspects into consideration. Hence, the approach is different to the derivation of the environmental quality standard values, which aims to relate to risks for adverse effects. If a background assessment criterion is used as a threshold value, this can be considered a more cautious assessment compared an environmental quality standard. Values based on background assessment criteria are currently not available for the HELCOM region, but could be calculated in future work. Foodstuff threshold values stem from legislation of the European Union (EC 2006). They are derived taking into consideration information beyond the environmental parameters, such as dietary standards of the concerned human population, typical levels of contaminants in different foodstuff, and trade. The aim is to identify and prevent contaminated foodstuff from being placed on the market. Thus, the foodstuff threshold values do not cover all combinations of matrices and contaminants relevant for an environmental assessment of the marine environment. Because of this, a full equivalence between foodstuff threshold values and EQS-values should not be expected, although the values can in some cases be very similar or even the same. The Baltic Sea Action Plan and the Marine Strategy Framework Directive have similar goals and objectives, and thus, progress towards achieving the regional aim can be assessed using the same indicators and tools. The ‘State of the Baltic Sea’ report covers the topics addressed by the four segments of the Baltic Sea Action Plan and its follow-up Ministerial Declarations, as well as the descriptors of the Marine Strategy Framework Directive. The assessment is organised according to Pressures on the environment (Chapter 4) and the status of Biodiversity and food webs (Chapter 5). The indicators used in the respective sub-chapters are listed in Table B.1.3.1 and Table B.1.3.2. Marine litter and underwater sound are new components of the Baltic Sea Action Plan, taken up by HELCOM in the Ministerial Declarations (Moscow, 2010 and Copenhagen, 2013). The EU Marine Strategy Framework descriptor related to the removal of commercial fish and shellfish can be associated with the provisions of 2013 HELCOM Declaration on ecosystem-based fisheries, while hydrological conditions cannot be directly assigned to any segment of the Baltic Sea Action Plan. Maritime activities, which is a focal area of HELCOM and one of the four BSAP segments, is linked to several of the descriptors, including eutrophication contaminants, and non-indigenous species. Table B.1.3.1. Indicators used in Chapter 4 of this report (‘Pressures’), and their relation to the segments of the Baltic Sea Action Plan (BSAP and the descriptors of the Marine Strategy Framework Directive (MSFD). Indicators marked * have not been adopted in HELCOM yet and are currently tested. Indicators in italics are under development in HELCOM and at this time only included descriptively in the report. The indicators are presented by the segments of the Baltic Sea Action Plan: Eutrophication (green), Hazardous substances (orange) and Maritime activities (blue), and the follow-up declarations (yellow). All indicators on eutrophication and hazardous substances are also relevant for the maritime segment of the Baltic Sea Action Plan. − Spawning stock biomass (of cod, dab, sole, herring, sprat) No indicator. Descriptive approach. Table B.1.3.2. Indicators used in Chapter 5 of this report (‘Biodiversity’), relating to the biodiversity segment of the Baltic Sea Action Plan (BSAP) and descriptor 1 of the Marine Strategy Framework Directive (MSFD). Indicators marked * have not been adopted in HELCOM yet and are currently tested. Indicators in italics are under development in HELCOM and at this time only included descriptively in the report. Some species migrate far and encounter several different environments and different types of pressures during their life. Other species are local and cannot move, even if the local environment changes, and the water masses around them have travelled long distances and include substances from sources far away. The status of pressures, species and habitats is influenced by multiple connections to human activities. The linkages between human activities and pressures are outlined in Chapter 3 Humans & the ecosystem, and the impacts of current pressures in the Baltic Sea on species and habitats are assessed using the Baltic Sea Impact index in Chapter 6 Cumulative impacts on the marine environment. Understanding these linkages also helps reveal important knowledge gaps for setting management targets and helps us to better understand how human activities depend upon, and benefit from, marine ecosystem services. Figure B1.2.1. Salmon eggs hatch in rivers with outflows into the Baltic Sea and spend the first parts of their lifecycle there, feeding on invertebrates and being dependent on the river water environment. After one or two years they grow into so called smolt and migrate to the Baltic Sea, where they mature into adult salmon and remain for a few years. During this time, a salmon may migrate hundreds of kilometres and encounter many different environments before returning to the river to spawn. Its health and survival is influenced by food availability, fishing pressures, and potentially also underwater sound, marine litter and the quality of available food, and it is dependent as well on the environmental quality of their spawning rivers. Photo credit: Esa Lehtinen. Figure B1.2.2. Bladderwrack is an important habitat-forming seaweed which colonises hard substrates in the Baltic Sea. In other seas it lives in the intertidal zone, but in the Baltic Sea it lives continuously submerged. Many small animals thrive among the structures formed by the seaweed, and it is a productive environment for small fish and benthic species. These small animals are also important for keeping the seaweed clean. The bladderwrack lives attached to the rock or other hard substrate all its life. It is sensitive to the quality of the surrounding water and hence eutrophication or changes in the food web can be damaging. When food webs are disturbed, due to a decrease of big predatory fish for example, this may also affect the number of small animals among the seaweed and the quality of this habitat. Photo credit: Nicklas Wijkmark. Oxygen conditions in the deep have been improved by a series of inflow events since the end of 2013. First, a series of smaller inflow events occurred in November 2013, December 2013, and March 2014. These interacted positively and reached the deep water of the central Baltic Sea for the first time since 2003 (Naumann and Naush, 2015). In December 2014, and in January 2015, a very strong inflow occurred, which transported 198 km³ of saline water into the Baltic Sea, and was followed by smaller events. An inflow of moderate intensity also occurred between 14 and 22 November 2015. These events caused intensified oxygen dynamics in the Arkona Basin, Bornholm Basin, and Eastern Gotland Basin, but the northern parts were not affected. As a result, the near bottom oxygen concentrations in the Bornholm deep ranged from 0.08 ml/l (in November 2015) to 5.4 ml/l (in February 2015), measured at 95 m water depth. In the Gotland deep, oxygen conditions ranged from -8.75 ml/l (in November 2013) to 2.9 ml/l (in April 2015 at 235 m depth; Nausch et al. 2016). Maximum ventilation occurred in May 2015. The major Baltic inflow of December 2014 caused the Bornholm Basin to become fully ventilated. Hydrogen sulphide was absent in the Gdansk Basin and Eastern Gotland Basin, and the former anoxic bottom water was replaced (See Figure 1.9, right map). This assessment uses core indicators to measure the status of the Baltic Sea marine environment on the basis of selected and representative elements. The HELCOM core indicators cover both biodiversity and human-induced pressures and impacts on the Baltic Sea ecosystem. The core indicators were selected according to a set of principles including ecological and policy relevance, measurability with the monitoring data and linkage to anthropogenic pressures (HELCOM 2013c). The HELCOM core indicators evaluate the observed status in relation to a regionally agreed threshold value, in many cases using data from regionally coordinated monitoring. Hence, the results indicate whether status is good or not according to each of the core indicators. The assessments are performed at the spatial scale of HELCOM assessment units, which have four different levels; each core indicator being assessed at its most relevant scale. For example, birds are assessed at level 1 which is the whole region, salmon and sea trout, as well as zooplankton are assessed at level 2 which further subdivides the Baltic Sea into sub-basins. Level 3 separates the sub-basins also into coastal and offshore areas, and level 4 uses a finer subdivision of coastal areas in line with national management practices such as water bodies as designated under the EU Water Framework Directive. Deterioration of marine biodiversity may result in welfare losses to society (see also Box 3.2 about losses in human well-being from the degradation of the marine environment, in Chapter 3.1 Activities, pressures, and welfare changes). Although the effects may not be directly observable, people obtain benefits from knowing that the marine ecosystem and its species are thriving. The value for biodiversity is, for the most part, independent of the use of the marine environment, and more related to the knowledge that habitats and species exist and are in good health. Improved biodiversity and marine health brings about increased economic benefits to citizens, which are lost if the state of the sea does not improve (cost of degradation). Some of these monetary benefits have been assessed in a stated preference choice experiment study in Sweden, Finland and Lithuania in 2011, which elicited citizens’ willingness to pay for improvements with regard to aspects related to marine biodiversity (Kosenius and Ollikainen 2015). The valuation study estimated the benefits from increasing the amount of healthy perennial vegetation (such as underwater meadows) and the size of fish stocks in the Finnish-Swedish archipelago and the Lithuanian coast from current to good status. The benefits were based on people’s willingness to pay for these improvements. Figure B5.6.1 shows the estimates per person. 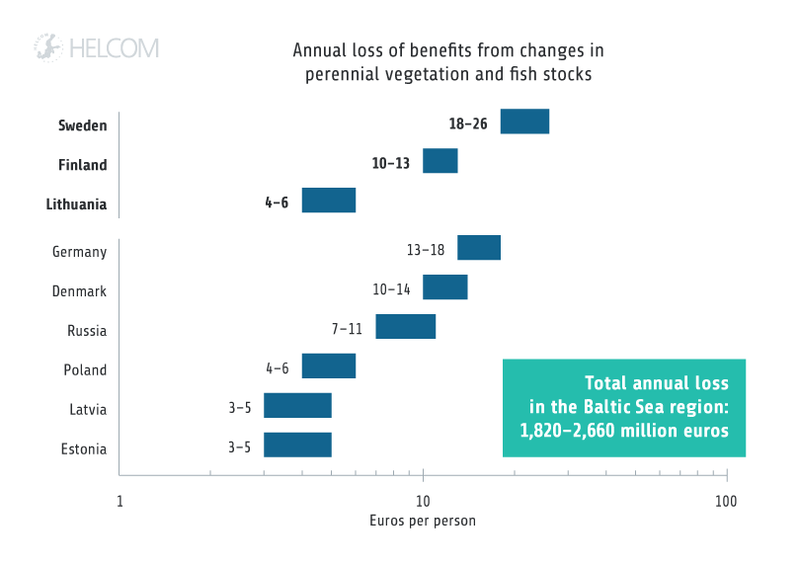 The results suggest that citizens’ welfare would increase by 1.8 – 2.6 billion euros annually in the Baltic Sea region, if the state of the perennial vegetation and fish stocks improved to a good status (see also Supplementary report HELCOM 2017A). It is worth noting that there is more uncertainty about these estimates compared to the estimates for eutrophication and recreation, as some of the values are based on benefit transfer. Figure B5.6.1. 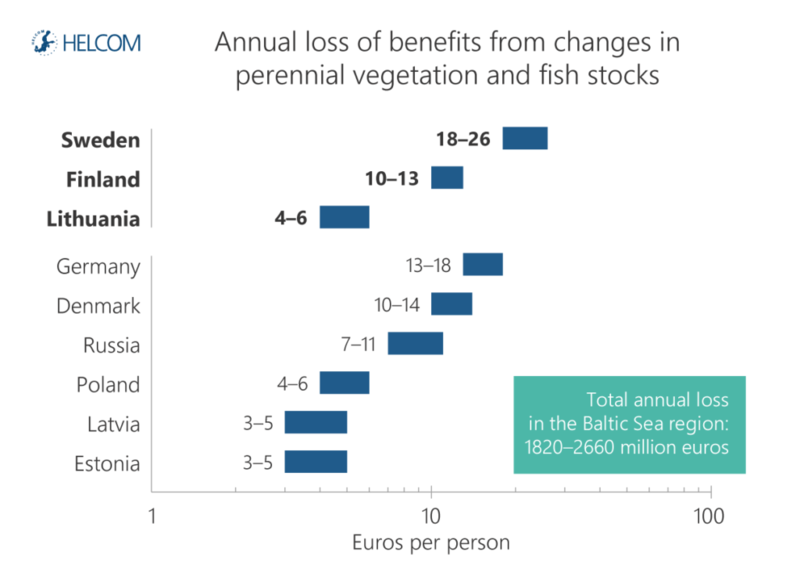 Benefit losses related to perennial vegetation and fish stocks. Note that estimates for Finland, Lithuania and Sweden are based on original valuation studies and data collection, and estimates for the six other countries are based on value transfer from Finland (Denmark and Germany) and Lithuania (Estonia, Latvia, Poland and Russia). The range comes from the 95% confidence intervals for the value estimates reported in the original study. Value estimates are in purchasing power parity adjusted 2015 euros. Source: Kosenius and Ollikainen (2015). Figure B4.1.2. 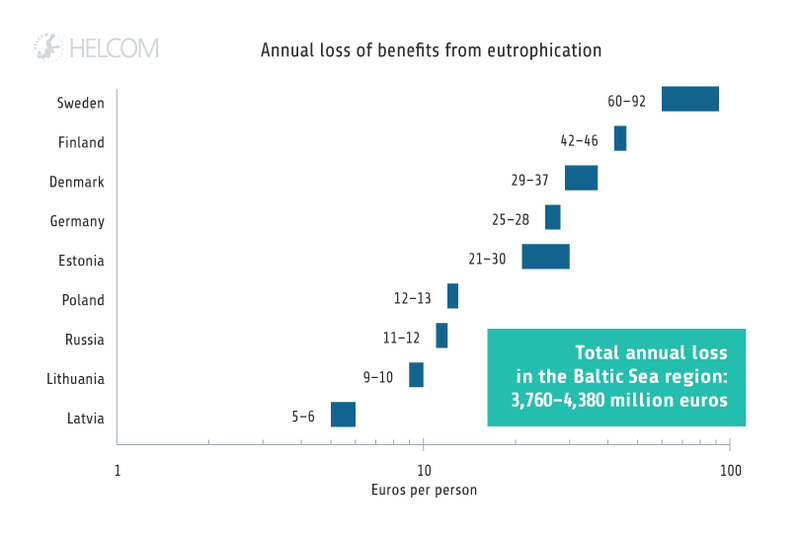 Annual benefit losses from eutrophication (euros per person) and total in the Baltic Sea region (million euros). The ranges show the 95% confidence intervals for the value estimates reported in the original study. Value estimates are in purchasing power parity adjusted 2015 euros. Source: Ahtiainen et al. (2014). 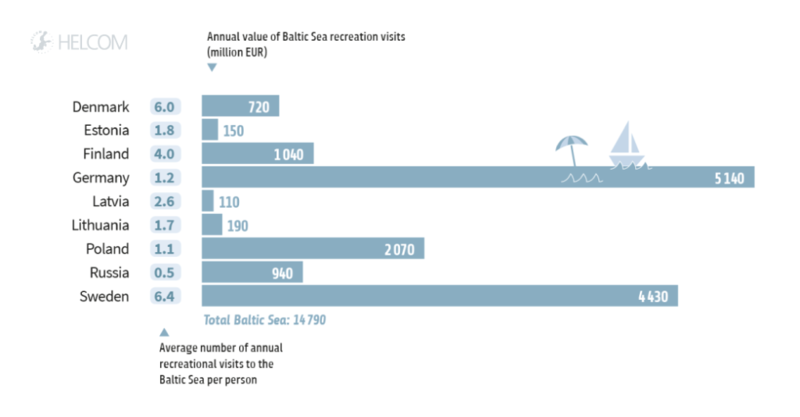 The value of current Baltic Sea recreation visits represents the economic benefits from the activity. The estimates are based on information about travel costs and the number of recreation visits people make to the Baltic Sea and its coast, and measure the total value of Baltic Sea recreation visits during a year. The total recreational benefits of the Baltic Sea are around 15 billion euros annually (Table B3.1). Table B3.1. Annual value of marine and coastal recreation and average number of annual recreational trips to the Baltic Sea. Data from the year 2010. Source: Czajkowksi et al. (2015). The losses in Baltic Sea recreation values due to the deterioration of the marine environment are measured based on a change in citizens’ recreation values from a one-step change in the perceived status of the Baltic Sea marine environment. The perceived environmental status was measured on a 5-step scale from ‘very bad’ to ‘very good’, with the average being ‘neither bad nor good’, and thus, a one-step change means an improvement from ‘neither bad nor good’ to ‘rather good’. The change in recreation values stems from the predicted change in the expected number of trips to the Baltic Sea when the perceived environmental conditions change, based on econometric modelling. The losses of recreation values due to the deterioration of the marine environment are estimated to be 1–2 billion euros annually (see Figure B3.3.1). Figure B3.3.1 Lost recreation benefits due to deterioration of the marine environment. 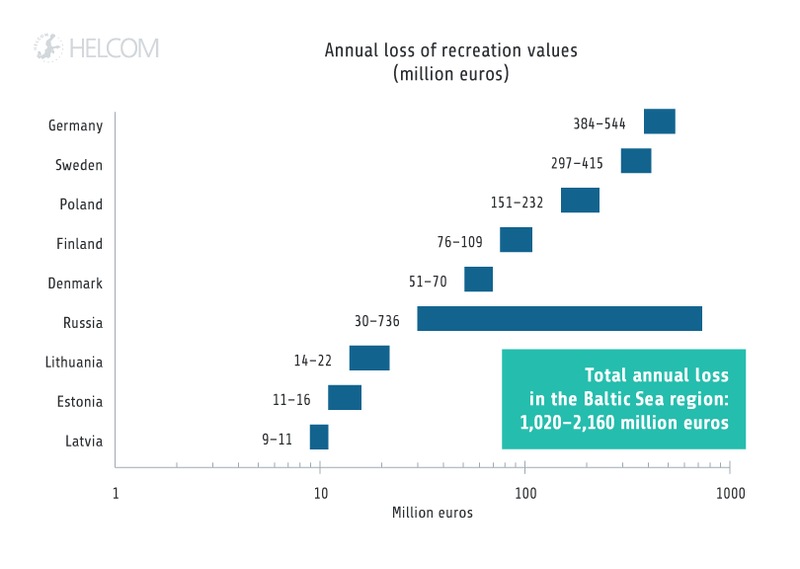 The total losses of recreation values are 1–2 billion euros annually for the Baltic Sea region. Value estimates are in purchasing power parity adjusted 2015 euros. Source: Czajkowski et al. (2015). Degradation of the environment causes many adverse effects that reduce the economic benefits (or welfare) that people obtain from the marine environment, including increased water turbidity and more frequent blue-green algal blooms, reduction and changes in fish stocks, contamination of fish and seafood, increased litter on the beaches and in the sea, and loss of marine biodiversity. The benefits that are lost if the sea does not reach a good environmental status are called the cost of degradation (see Figure B3.2.1). The losses in human welfare can be assessed in monetary terms based on economic valuation studies that estimate the effect on citizens’ benefits from changes in the quality of the marine environment. The focus can be either on degradation themes, such as eutrophication, or ecosystem services, such as recreation. Baltic Sea wide studies with value estimates for each coastal country give the best estimates at regional level. When no such data are available, value transfer can be used, so that estimates from a subset of Baltic Sea countries are transferred also to other countries. Results from currently available analyses are presented in this chapter for recreation (Box 3.3), in Chapter 4.1 for eutrophication (Box 4.1.2) and in Chapter 5.6 for selected biodiversity aspects (Box 5.6.1; see also supplementary report: HELCOM 2017A). 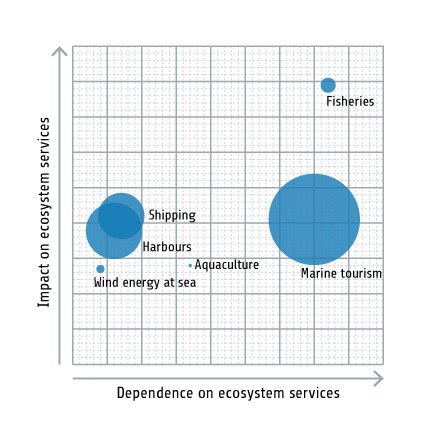 Further improving our understanding of the economic contribution from marine activities will require harmonised data across all coastal countries, reporting data separately for different sea areas (Baltic and North Seas), and differentiating between land activities, freshwater activities and marine activities, especially for tourism. Remember to add identifying trigger (class, or id) , and add it to “Call to Action” button. Use identifying trigger names, such as .article-name, or #article-name. Set “Call to action” button url to #.